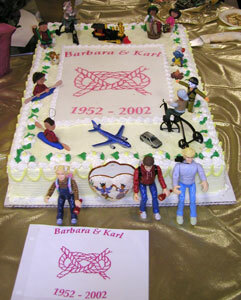 Barbara's sewing and quilting have been a key activity throughout life together. After her retirement she has been active in several quilting and needlework guilds and has shown her quilts in many venues. Nearly every family member has received something over the years that she has hand-made specially for them. From early "calling" of square dancing here and while in college in Indiana to all forms of line dancing, schuplattle, and other international traditions. Over the years Karl and Bah have often attended Maine Folk Dance Camp and other events with national dance leaders. They have danced for more than 40 years with the Washington Schuhplattle groups led by Dave Rosenberg, and Karl served as Vorplattler for a few years. Fritz has continued to carry the baton with active involvement in German history and "plattle". In recent years Karl and Bah have specially enjoyed English Country Dancing.